Christmas 1996 was the first Christmas Tim (still single at the time) lived in his own house. He wasn’t planning a huge display, but he did want something to be unique. This particular house had a large windowless wall facing one of two streets the house was situated on. 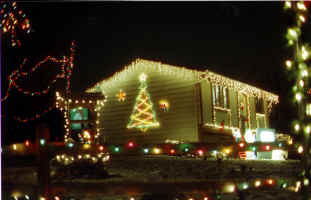 The idea Tim came up with was to place a “big tree of lights” on this side of the house. The plans were literally drawn up on a Magna-doodle toy Tim had left over from college days. 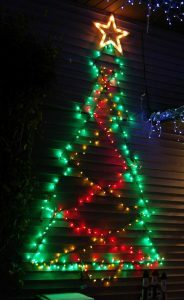 The materials for the tree were exceedingly simple and cheap, but the result was quite nice. 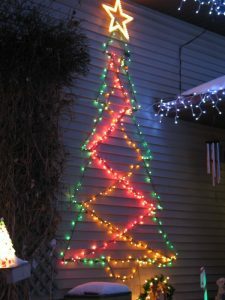 The tree is simply made up of three strings of lights: a green string to outline the shape of the tree, and red and yellow strings for the “garland”. The lights were simply wound around nails placed in the wood siding of the house. 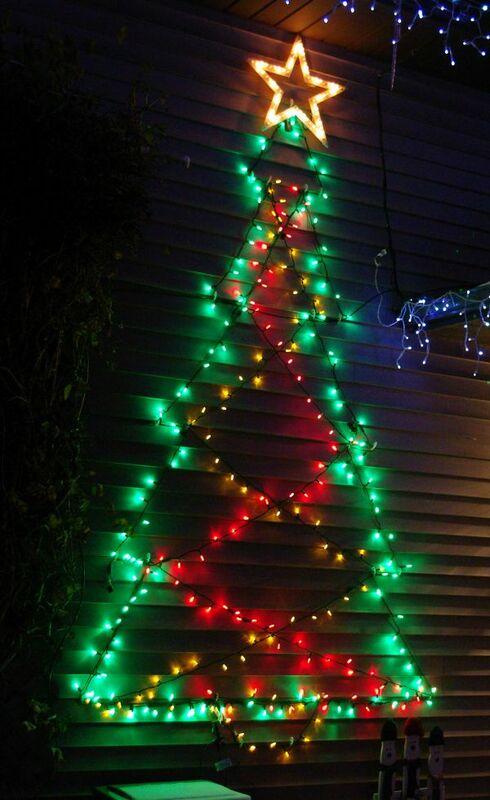 After the tree was finished, it wasobvious that something was missing– it needed a star. A “marquee star” by Noma fit the bill perfectly, and is perfectly-sized for the tree. The white lights “chase” around the perimeter of the star. Measuring over 13 feet tall, and about 20 feet from the ground to the top of the star, it was a very prominent feature for the six displays at the original house. In July 2002 we moved to a new home. As this house did not have the “large empty wall”, we were unsure if we would be able to continue this feature in our new displays. We did, however, find such a place where it still looks great, and greets people coming to our front door, which is right next to the tree. We now use siding clips under the vinyl siding rather than nails, but otherwise the construction is the same. For the 2011 season it was time for another refresh. 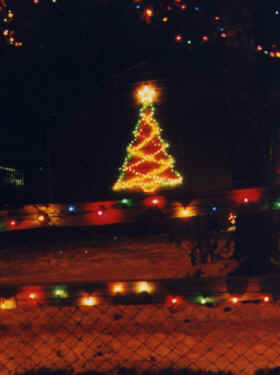 We replaced all the lights of the tree with commercial-quality LED lights, which gives the tree much richer color than the aging incandescent lights used up until now . The Noma star, purchased for the original tree in 1996, is still going strong.